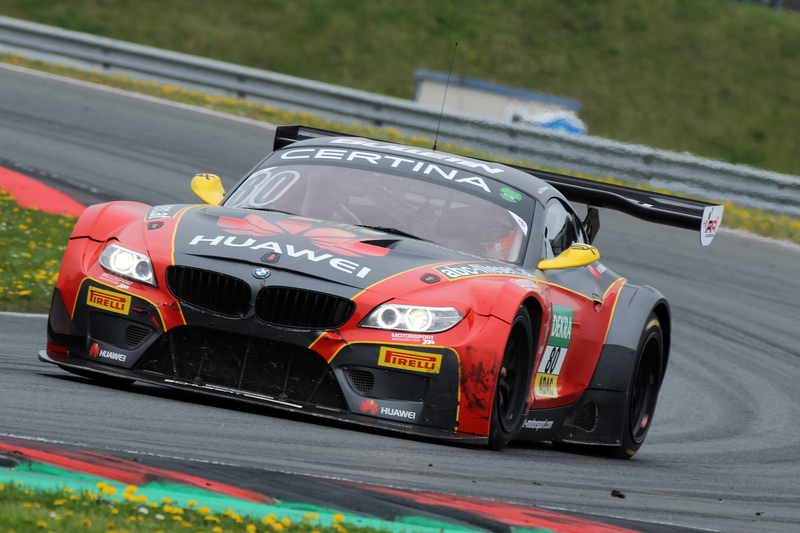 Exciting season opener in the Super Sports Car League – Dominik and his new BMW Sports Trophy Team Schubert team-mate Jens Klingmann achieved a P5 and a P7 in the first two ADAC GT Masters races at Oschersleben with the BMW Z4 GT3 powered by HUAWEI, displaying #80. Dominik, the first race weekend of the ADAC GT Masters season is over. How would you sum it up? Dominik Baumann: Working with Jens went very well. It’s exactly the driver pairing that we wanted, but it was very difficult for us to do anything in the race. Unfortunately, we couldn’t really attack. I had bad luck in qualifying with the red flag coming out just as I was ready to post my fastest laps. Still, I secured third place on the grid, so I was reasonably happy under the circumstances. What happened in the next two races? Dominik Baumann: Fifth place in the opening race of the season was okay. That gave us our first points! Jens made a great start to the second race. Unfortunately, we then got a five-second pit stop penalty, which wasn’t brilliant. I thought at first that we would emerge in front of the Corvette which had been behind us, but then the safety car came out just before the pit stop window opened, causing the whole field to bunch together. There’s nothing you can do when you have to remain stationary for five seconds. Of course, I still tried to extract the maximum from the car, but it wasn’t possible to do better than seventh place after the penalty. Obviously, that wasn’t what we had hoped for. So, qualifying is the key to a successful weekend? Dominik Baumann: Absolutely, we just have to finish as far forward as possible in qualifying. That’s paramount. Neither of us drivers made any real mistakes at the weekend, but we both simply found the going tough with some of the other cars in the field. We couldn’t drive next to our competitors and outbrake them to overtake. We were at times easy meat for the others, and that’s why qualifying is so important for us. Once we’re in front, then we can stay out in front. Jens Klingmann is your new team-mate. Have you already got used to one another? Dominik Baumann: We shared a car last year at the Nürburgring. I’ve know Jens for some time, we have an excellent relationship. It’s great, being together. We enjoy a laugh, and there’s a relaxed atmosphere amidst absolute professionalism. I think we suit each other very well, as do our driving styles, which is why we have no problems when setting up the car. We work towards a common goal and try to do our best. Dominik Baumann: Of course, the win in the qualification race for the 24-hour event gave us a lot of confidence. We know what we can do. That’s why we set ourselves the goal of victory in the Eifel. You can only win this long race if there’s not a scratch on your car at the end of it. We proved in the qualifying race that we can do that. Clearly, a lot can happen in such a long race, but we don’t need Lady Luck to smile on us particularly, we just need not to be unlucky. At any rate, if everything goes smoothly, we should be up there with the front-runners. You are off next to the Red Bull Ring for the ADAC GT Masters and your home fixture. How will it feel to be back in Austria? Dominik Baumann: I’m really looking forward to the race at Spielberg, for sure! Many friends and some of my business partners will definitely be in the stands to cheer us on, which makes it all the more important to be up there, mixing it with the front-runners. We’ll certainly have to work hard, but I’m already looking forward to this amazing setting and the terrific atmosphere that you always find at this track. The Red Bull Ring has very few turns, and so you must avoid mistakes, especially on a hot lap in qualifying. For us drivers, it’s sometimes easier when there are more corners – you can then find your rhythm more quickly, but I’ve no worries on that score as far as we’re concerned. Once we’re in front in the quali, then we’ve got a good chance of staying there – that also applies to the Red Bull Ring.